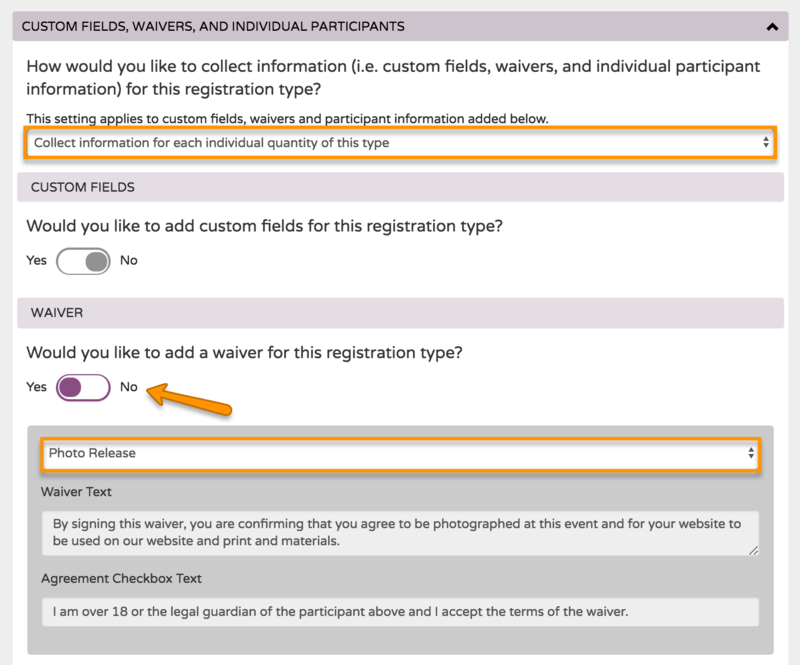 You can add a Waiver to each individual Registration Group type in a campaign from within Advanced Settings. This waiver will be applied at checkout for any supporter who purchases that registration type. Go into the Campaign Editor > Tool Settings > Manage Registration > Edit the Registration Group > Show Advanced Settings > Custom Fields, Waivers, and Individual Participants for the registration type you want to add the waiver to. From the dropdown menu, select whether to apply your custom fields, waivers, and individual participant information collection settings just to the Registrant or purchaser (once per item type) or to the Individual Participants or ticket holders (to each quantity of this type). Scroll down and toggle Would you like to add a waiver? to Yes. Select a saved Waiver from the dropdown list or "Create a New Waiver" from the dropdown menu to create one on the spot. Once finished, click Publish Registration Group. Note: It will require a typed signature, birth date, and for the person filling the waiver area out to confirm they are 18 years old or more. 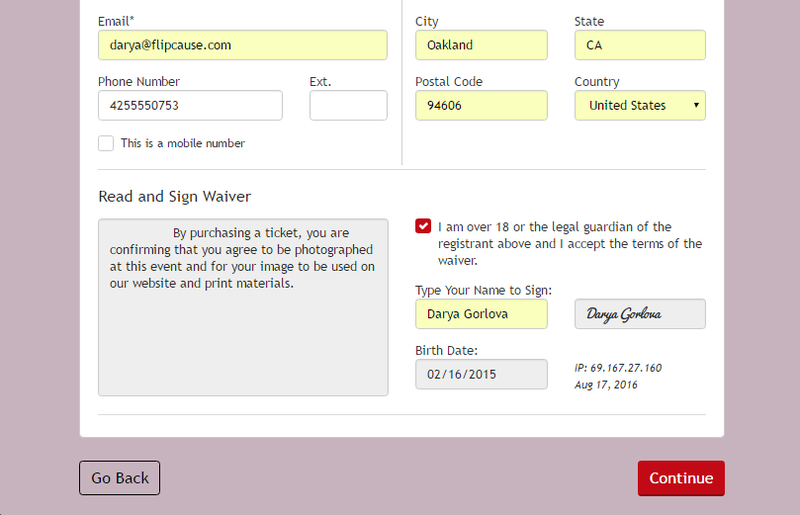 You can also add a single Waiver to an entire order from within Order Settings. This waiver will display at checkout regardless of the activity within a supporter's transaction. Go to Campaigns > Edit This Campaign > Order Settings > Waiver (Applied to Entire Order) and toggle the option to Yes. Once this option is toggled to Yes, you will be able to select your waiver from the drop down menu. This menu pulls up the list of available waivers, which can be set up in the Waivers area of your Campaigns area. Be sure to hit Save when done!